The Dividist Papers: Gridlock is really good. Really. Gridlock is really good. Really. 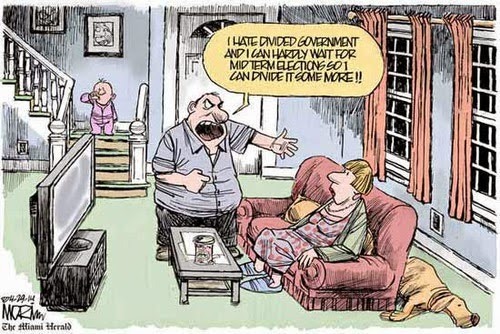 The Dividist has complained in the past about the propensity of pundits and bloggers to conflate the concepts of "divided government" and legislative "gridlock". The terms are often used erroneously as interchangeable synonyms. Yet, even the Dividist has occasionally employed this semantic shortcut, such as in the July, 2010 post "Gridlock is Good." In that post the beneficial aspects of partisan legislative gridlock was presented in the form of gridlock preventing a negative outcome - specifically stopping bad bills from being passed into law (see legislative abominations - Porkulus and Obamacare as examples of the damage done when one party has the power to pass legislation on pure partisan votes). The underlying common sense notion is that divided government and partisan gridlock prevent the worst instincts of either party from becoming law. When the moderating influence of legislative gridlock is bypassed, we get legislation no one really understands, except the special interests that helped craft it. So we are treated to the spectacle of our legislative leaders explaining that we won't know what sweeping legislation will accomplish until after it is signed into law. Our legislators may not know what they are passing, but once it gets to the agencies administering the law, the special interests do. In a recent Cato Institute Policy Analysis, Marcus E. Ethridge (University of Wisconsin Political Science Professor) outlines a new positive argument for the inefficient, constitutionally divided, and often gridlocked legislative process. Ethridge offers a compelling case that our inefficient checked, balanced, and divided government is far less susceptible to special interest influence than the more efficient executive branch agency rule-making process preferred by Progressives impatient for rapid change. "In the wake of the 2010 elections, President Obama declared that voters did not give a mandate to gridlock. His statement reflects over a century of Progressive hostility to the inefficient and slow system of government created by the American Framers. Convinced that the government created by the Constitution frustrates their goals, Progressives have long sought ways around its checks and balances. Perhaps the most important of their methods is delegating power to administrative agencies, an arrangement that greatly transformed U.S. government during and after the New Deal. For generations, Progressives have supported the false premise that administrative action in the hands of experts will realize the public interest more effectively than the constitutional system and its multiple vetoes over policy changes. The political effect of empowering the administrative state has been quite different: it fosters policies that reflect the interests of those with well organized power. A large and growing body of evidence makes it clear that the public interest is most secure when governmental institutions are inefficient decisionmakers. An arrangement that brings diverse interests into a complex, sluggish decisionmaking process is generally unattractive to special interests. Gridlock also neutralizes some political benefits that producer groups and other well-heeled interests inherently enjoy. By fostering gridlock, the U.S. Constitution increases the likelihood that policies will reflect broad, unorganized interests instead of the interests of narrow, organized groups." This is an important read but not an easy one. Etheridge challenges conventional thinking about why special interests hold such sway over public policy. He explores the mechanism by which their financial and lobbying muscle are applied to maximum effect influencing public policy and resources in direct contradiction to the public interest and even legislative intent. Distilling his 20 page argument into a blog post is difficult if not impossible. We will instead excerpt a few representative paragraphs, comment briefly on salient points introduced in his analysis and encourage you to read the whole thing. Professor Ethridge weaves several themes while presenting his case. He provides a historical framework for progressive political and intellectual thought from Teddy Roosevelt to Paul Krugman, demonstrating a consistent refrain of distrust, frustration, and even disdain for the constitutional legislative process. He shows how Congress has abrogated it's constitutional legislative responsibility by granting a stealth law-creation authority to administrative agencies and bureaucrats in the executive branch. Finally he shows that an unintended consequence of this congressional delegation of their constitutional responsibility is that the power and influence of special interests on policy are magnified enormously. "The Progressive assault on the Constitution’s intentionally difficult system of policy making is based on the idea that a more efficient process would remove opportunities for obstruction. Believing that the forces of obstruction are naturally against social equality, Progressives have long believed that a process less prone to gridlock must therefore produce efficiency and equality. Sufficient evidence has accumulated to demonstrate that Progressives are profoundly wrong: interests that enjoy the political advantages of superior organization become more influential when government can be more efficiently moved to action, and those interests are not often the ones demanding greater social equality. Thus, a century of Progressive success in transferring legislative power outside the Madisonian system has left the proponents of social equality severely disappointed." "The Obama administration and its allies in Congress have fully embraced the Progressive approach. Even with strong Democratic majorities, it was difficult to enact the President’s major legislative accomplishments (health care reform and the Dodd-Frank Financial Reform Act). If the bills had included provisions that explicitly decided virtually all the major policy choices involved, their passage would not have been possible. Consequently, all of Obama’s significant legislative successes provided for the delegation of legislative authority to a variety of executive branch commissions and agencies, side-stepping some of the difficult political decisions. Moving some important legislative tasks outside the gridlock-prone constitutional system made it possible to pass these landmark bills. With a breathtaking disregard for the Constitution’s first section (“All legislative Powers herein granted shall be vested in a Congress of the United States, which shall consist of a Senate and House of Representatives”), members of Congress were put on notice that if they failed to pass the administration’s favored climate-change legislation, the Environmental Protection Agency would resolve the issue by using its power to restrict carbon-dioxide emissions as a “pollutant.” It is a stunning demonstration of Progressivism’s hold that so few citizens or commentators found this explicit assault on basic constitutional provisions noteworthy." Not only does congressional deference to executive branch administrative rule-making make it easier for special interests to influence policy, it turns the framer's intent completely on its head. Executive Branch agencies are now empowered by Congress to create far reaching rules and regulations governing great swaths of the economy (healthcare, banking and finance, energy, defense, homeland security, etc.). Instead of the legislative branch creating laws that the executive can only veto, the Legislative branch is relegated to the role of monitoring and vetoing the laws, rules, and regulations effectively issued by edict out of executive branch agencies. Ethridge explicitly invokes Constitutional language defining law-making responsibilities of the Executive and Legislative branches, demonstrating how far we have diverged from the intent of the framers and founders. But is this fair? Did the founders really deliberately design inefficiency into the Constitutional law-making process specifically to frustrate special economic interests from unduly influencing government policy? Or is Ethridge imposing a modern policy perspective on a Constitutional framework that never anticipated and is not equipped to deal with these contemporary issues? It is instructive to go the source and reviews exactly what the man credited as the architect of the Constitution said at the time. The influence of factious leaders [special interests] may kindle a flame within their particular States, but will be unable to spread a general conflagration through the other States. A religious sect may degenerate into a political faction in a part of the Confederacy; but the variety of sects dispersed over the entire face of it must secure the national councils against any danger from that source. A rage for paper money, for an abolition of debts, for an equal division of property, or for any other improper or wicked project, will be less apt to pervade the whole body of the Union than a particular member of it; in the same proportion as such a malady is more likely to taint a particular county or district, than an entire State." On this point at least, Professor Ethridge is on firm ground. It is clear the Constitution's bicameral and expansive legislative branch was designed in part specifically to thwart narrow economic and other interests from imposing their will on legislation affecting the country as whole. As Ethridge points out, that protection is lost when Congress effectively delegates their legislation authority to executive branch administrative agencies. While finding most of the Professor's argument to be persuasive, this blogger takes issue with his exclusive focus on blaming Progressives for this state of affairs. Promoting and implementing a Constitution-subverting legislative process by delegating legislative branch responsibilities to the executive branch is clearly not the exclusive domain of progressives as implied in this analysis. One could point to the Military Industrial Complex caution of President Eisenhower as an early warning. Here we see special interests having undue influence on executive branch agencies with inadequate congressional oversight shaping and influencing defense policy and procurements that should properly be the domain of Congressional legislation. "Does the number of warships we have, and are building, really put America at risk, when the U.S. battle fleet is larger than the next 13 navies combined — 11 of which are our partners and allies? Is it a dire threat that by 2020, the United States will have only 20 times more advanced stealth fighters than China? These are the kinds of questions Eisenhower asked as commander-in-chief. They are the kinds of questions I believe he would ask today... "What it takes is the political will and willingness, as Eisenhower possessed, to make hard choices — choices that will displease powerful people both inside the Pentagon, and out." The corruption and waste to be found in the procurement of weapon systems could and should be the poster child undue special interest influence on public policy. One might even suggest that the military industrial complex is the model that showed those who would influence policy makers in executive branch agencies exactly how it is done. What better example can be found of a public agency captured by special interests to shape policy for private gain than what is found in Defense, Intelligence, and Homeland Security? If Professor Ethridge focused on these agencies in addition to the unseemly special interest influence on social, environmental, and economic regulatory agencies favored by progressives, he would have a stronger argument. By limiting his focus on this issue to progressives he leaves himself open to a charge of political bias and undermines the most important point of his analysis: Constitutionally proscribed legislative processes and funding should remain within the domain of the inefficient and often gridlocked Congress, and not abrogated to efficient executive branch agencies easily captured by special interests - regardless of whether those agencies are perceived to be pursuing a progressive or conservative agenda. Hat tip to John from Falcon for the e-mail tip. I like gridlock on the general principle that government isn't very good at doing things. Half a century of observation has convinced me that if they're not doing anything, they're not making the situation WORSE. And if they ARE doing something, they're generally screwing the situation up more. 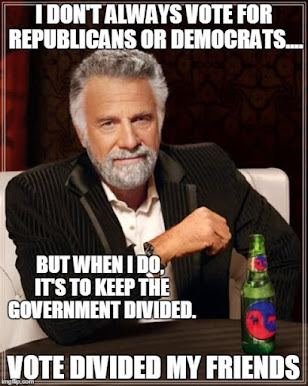 After almost five years of flogging this meme, I am just astonished to find a brand new argument for gridlock and divided government that I had never heard before. Ethridge argues Gridlock is good because in keeps a progressive agenda from being subverted by special interests in executive branch agency administrative rule making. Well - that is only if the the Progressive agenda can be successfully and explicitly legislated though a gridlocked legislative proces - which seems unlikely. Ethridge presents something of a Hobson's choice for Progressives.